Whilst Manchester celebrates the tenth anniversary of the release of St Jude, it's often forgotten that on the same day James released their comeback album Hey Ma, their first for six and a half years, and which also hit the top ten. We take a look back at the album and reproduce our review at the time from the One Of The Three James archive site that we run. It was a cold January night back in 2007 when I got a call from Tim Booth. I was hanging up washing in the spare room of my flat. We hadn't spoken for a year or so on the phone (I still run his website and Facebook page) so I was curious. He explained that there was going to be a big announcement in a day or so about some tour dates and could I leak the word out via my fan site that was still active. He then proceeded to tell me about all the new material they'd written. These were the days when a band would reform and play the hits and then stop. Hey Ma sort of broke that mould, they released two new songs - Who Are You? and Chameleon - as part of a greatest hits package, but they then started to introduce new songs into their set - Upside being a staple on the reunion tour, but then new songs being dropped into intimate shows they did in the summer as festival warm-ups. In true James tradition though, the likes of Traffic and Not So Strong, which were eagerly talked about by the fan base, never actually made the record. They announced two shows at Hoxton Bar And Kitchen in London and played two nights of completely unreleased and mostly unplayed material - most of which became the Hey Ma album but some more than never saw the light of day. They went from London to Chateau Warzy in France where they fashioned a studio and recorded the album with Lee Muddy Baker who had worked with Tim on his Bone solo album a few years before. The album was then released on April 7 and accompanied by an in-store HMV session on Market Street in Manchester which ironically was a few hours after Courteeners had launched St Jude in the same room. The band then went on a two and a half week tour where they played most of the album every night. Without being available in supermarkets, the main place in those strange times to buy CDs, and with no vinyl release (it later came out in the US only on vinyl via Decca), the album hit the top ten. Whilst bands reform ten-a-penny now and most do now eventually release new material after a couple of years, this was the blueprint that few if any had followed before. 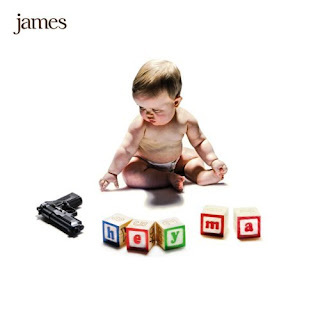 Today Hey Ma still stands tall as one of the best albums of James fourteen-strong, soon to be fifteen, back catalogue. Songs like lead "single" Whiteboy, Of Monsters And Heroes And Men and I Wanna Go Home still have a place in the live set whilst the fresh improvisational spirit and energy that drove, and still drives, James' best work can be heard in every note from the beautiful Bubbles to the fade of I Wanna Go Home. There’s a line in the first verse of Boom Boom which goes “we’re late, we should have been here sooner” that for me says everything you need to know about Hey Ma. Freed from the infighting, the pressures of stardom and the need to make a hit record, this is the most coherent, together record James have ever released. It sounds like a record of a band at perfect ease with one another. After a few listens, it’d be inappropriate to say whether it is their best. The excitement of new material can’t really be compared to fifteen years of familiarity with their previous highpoints Seven and Laid, but it can be talked about in those terms in a way which Whiplash, Millionaires and Pleased To Meet You, great albums that they are, could not.It’s fresh, it feels free of constraints and it’s got passion and it’s got a continuity of spirit and purpose in a way not even Seven and Laid managed. When Larry talks about popular songs – Not So Strong, Traffic, Start A Fire – not fitting into the album, it makes perfect sense when you hear the record. The wonderfully subtle production gives the listener a little more on each listen.Take all the best bits of those two albums and you get Hey Ma. It’s hard to come over all technical and write about the songs individually without draining something from them. No doubt the boards will be full within a week of reports that can describe this album far more eloquently than I ever could. Bubbles opens the album and immediately sets the tone. The instrumentation is allowed to breathe with a very simple production, and there’s a preciseness and purpose to the flourishes of Larry’s guitar work. Around half way through, the song bursts into life with Andy’s trumpet and some subtle, but rather majestic, keyboards. Lyrically it’s not changed significantly since its unveiling in Edinburgh last year. It’s a great opening track. The title track starts off very sparse with an acoustic-sounding guitar through the first verse. The subject matter is very clearly the 9/11 attacks on New York and the subsequent wars in Iraq and Afghanistan – lines such as “now the towers have fallen so much dust in the air” and “from the fall came some choices, even worse than the fall” and “war is just about business” are as direct as Tim has ever written. Despite the rather sombre subject matter, the song itself sounds very upbeat. Waterfall is simply a masterpiece. The opening instrumental section is dominated by Andy’s trumpet, but not smothered and that’s a theme that runs through the album. Each member of the band’s unique abilities shine through on this record, but they don’t diminish or override each other unlike where previous albums have sometimes lost a little of the edge in the songs through an overbearing or too full-on production and mix. The song appears to be about escaping from the mundane everyday life – “don’t need a phone company to tell you life’s pay as you go” – and escaping to a place where you can be free and express yourself. Oh My Heart is a balls-out old-school James anthem. It’s driven by the imprint of Larry’s guitar which is all over the song, at times seemingly out of place, coming in at the wrong time, but ultimately sounding pretty much perfect. Boom Boom maintains the pace and the intensity of the album. It is a very direct attack on the music press, and possibly the record company. The “laughing out loud” reference in the chorus is driven by the success of the reunion despite the apathy of the target (“you wrote us off as part-time losers”). The song ends with a slowed down instrumental section when you’re expecting one final soaring chorus. It’s an interesting end, but fits well with what comes next. Semaphore is where the brakes are put on for a few minutes. It’s a gloriously sculptured piece based around Larry’s guitar work, recalling the beauty and poignancy of most of the Laid album. Tim’s “la la la la la la la” in the closing section makes the hairs on the back of my neck stand up every time. Upside starts off stripped down from the version premiered at shows last year, but this just makes the chorus even more emphatic at communicating the message of the song, about the loss felt of being away from a loved one. As Tim’s vocal comes in, so does the crash of a drum and the whole thing, despite the subject matter, is euphoric. The instrumental end section is ushered in by a blast of trumpet and it excites in a way the very best James songs always have, and still do. Whiteboy is the album’s fun song – it’s not the best track on the album, but it’s a good first choice for radio play. Starting with the playful “ah ah ah ah ah ah ah” it’s very definitely autobiographical although quite who the whiteboy can’t be determined from the song. 72 is another song about the state of the world and the conflict between religions – “what kind of God are you dreaming of? A God of blood not love” – and the chorus is simply Tim singing war. It’s probably the least immediate track on the album, and takes a few listens to get into. Of Monsters And Heroes And Men is a half-spoken, half-sung story, which, according to the press release, is loosely based around a poem. It’s very minimalist in instrumentation, except for a gorgeous yearning trumpet. The ending of the song is stunning, Tim’s vocals almost become a mantra with simple but effective backing vocals before slowly fading out and being overtaken by Andy’s trumpet. I Wanna Go Home brings the album to a close. It has a haunting feel to it starting with Tim singing over a very simple backing underpinned by drums and an occasional flourish of violin about a man feeling lost and misunderstood by the world around him. It builds slowly to a conclusion which reflects the subject getting more and more affected by his situation. It’s a wonderful way to close the album. So, to conclude, Hey Ma is more than we could have hoped for. The old men (that’s a JOKE, guys) have still got what it takes to wipe the floor with the next bright young things placed on a pedestal by an ever more conservative music press looking for soft controversy, join the dots “indie” (ie as mainstream as Kylie and Girls Aloud) and easy categorisation. Is it their best? It’s their most coherent, most together, most purposeful release and it will stand the test of time. I can’t, hand on heart, say they’ve released a better album. Although when you have three such as Laid, Seven and Hey Ma, you’re splitting hairs at the end of the day. Buy it, listen to it, and if you have a pulse, fall in love with James all over again.